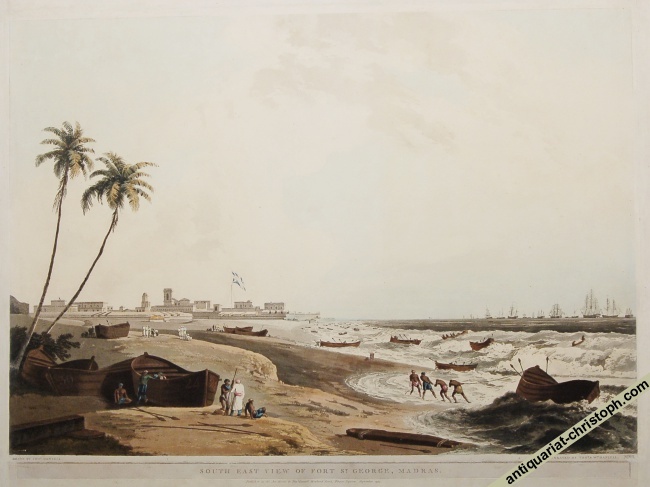 "South East View of Fort St. George, Madras". View of the Fort by the shore with fisher boats in the foreground and sailing ships in the distance. Aquatint in original colour by Thomas and William Daniell after a drawing by Thomas Daniell, publshed by Thos. Daniell "Howland Street, Fitzroy Square, September 1797". PM 48 x 65, sheetsize ca. 54 x 74 cm. Thomas Daniell and his nephew William were in India from 1785 to 1793 and published in Britain between 1795 and 1808 a monumental work, "Oriental Scenery", with 144 prints of Indian scenes plus engraved titles in 6 parts. Our view of Fort George, printed on J. Whatman wove, is Pl. VII from the second part. - Fresh colours, only in sky vaguely faded. Full impression of the plate. Additional wide margins with the original gilt edging. Alas, the margins around the view were folded back once by a former owner to give the impression of a watercolour. The folds smoothened and reinforced at the back, but because of the strong paper slightly visible.